In what may be the most hilarious 15 seconds you will see today, a father interrupts his young son's shower with a scare prank. A boy is peacefully having a shower, while giving his best rendition of Katy Perry's Dark Horse, when his trickster of a father tosses a glass of water into the bath tub. Surprised by the unwelcome object, he's heard yelling, "Dad, are you kidding me?" Unfortunately the practical joke doesn't end there, because this dad has a sinister sense of humor. The boy opens the door only to be spooked by, you guessed it, his dad wearing a gas mask. 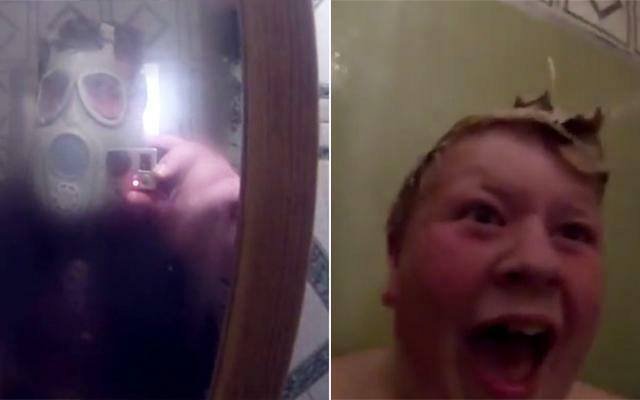 After belting out a high-pitched shriek and seeing he's being filmed, the terrified kid dives into the tub. Have you ever been the target of an epic and embarrassing prank? Let us know in the comments.